The conversion of carbon dioxide and hydrogen gas to methane via the catalyzed Sabatier reaction, commonly known as carbon dioxide methanation, is the proposed method for producing on-site fuel for a return rocket from Mars. The catalysts currently used are unable to withstand the elevated operating temperatures and the high exothermicity of the Sabatier reaction, resulting in their irreversible deactivation. Mitigation of permanent catalyst deactivation has shown to be a prominent obstacle in designing a robust catalyst for fuel production on Mars. 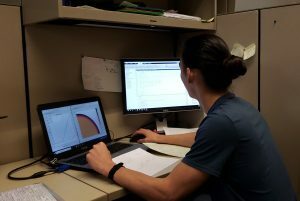 My project consists in combining computational and experimental methods to examine the source(s) of irreversible deactivation and the role(s) the catalyst supports have on catalytic performance and durability.